The pharmaceutical supply chain has grown increasingly complex due to medications being manufactured, distributed, stored, and consumed in hundreds of countries – making it easy for counterfeiters to introduce fake medication throughout the supply chain. This increases risk for the pharmaceutical industry and global pharma companies, as consumers may consume medications that have no effect, or worse, cause injury or death. The existence of fake medicine in a company’s supply chain presents problems in regulatory compliance, consumer protection, brand reputation, and company viability. Pharmaceutical companies are addressing the counterfeit medicine threat by serialising their boxes and individual packs of medicine. Governments around the world have issued new serialisation regulations with varying dates for compliance. (The infographic below provides more detailed information on serialisation). Fortunately, ERP systems like SAP Business One already provide the centralised data management and collaboration features to comply with serialisation regulations strictly governed for the pharmaceutical industry. SAP Business One allows companies to both automatically and manually assign serial numbers to individual items, packets, boxes, etc., providing the ultimate flexibility in complying with evolving regulations. 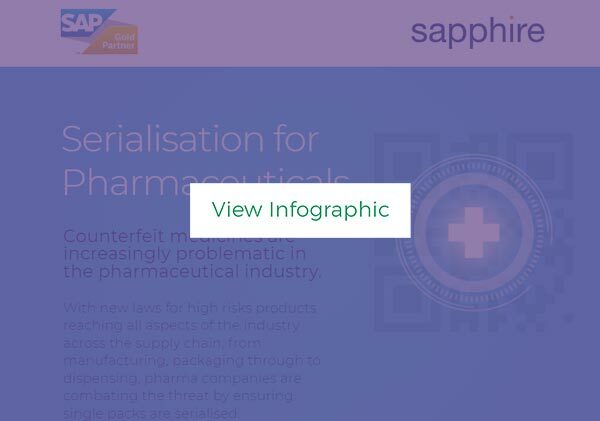 By integrating SAP Business One into the global verification databases for serialisation, a pharmaceutical company is ready to comply with global regulations and fend off counterfeiters throughout the supply chain. At Sapphire, we have more than just SAP Business One expertise – we support SAP implementations around the world, leveraging around-the-clock support staff. With our in-depth pharmaceutical industry experience and global footprint, we’re ready to help any company streamline their efforts around serialisation of medicines for their customers and supply chains around the world. Discover how our ERP system can support your pharmaceutical business.